A humongous number of internet users and vital presence of information technology in daily lives have upped the pressure on the backroom boys of the industry - programmers and coders - in China, driving trolls of criticism and derision. The recent heated social debate around the 996 overtime working culture in the IT industry is the very amplification. According to the 43rd Statistical Report on the Internet Development in China issued by the China Internet Network Information Center, the number of Internet users in China was 829 million by December 2018. Such large numbers of users need IT professionals to be continuously on their toes to update data related to important services such as stock markets and public utilities. It also requires internet practitioners to keep an "all in" mind at all times. Furthermore, with fierce competition among globalized internet products and services, internet professionals have to spend more time polishing every product and repeatedly deliberate on rules to be ahead of the competition, and make innovations and breakthroughs in the business model - all this originates from an "all in" mind. It is the Chinese people's tireless pursuit and desire for success that has brought the Chinese internet industry to the forefront of the world. We have never slowed down, but continue to pursue excellence and make more contributions to the cyber world. From this point of view, we can say that we are still on the road, and we still need an "all in" mind, which is definitely going to be an irresistible trend of the future. Under the influence of the "all in" mind, Chinese programmers have achieved product excellence while earning high remuneration, but there's another side to their dedication. They usually sacrifice a lot of leisure, reduce time with their families, cut on entertainment, go without a fitness routine, and often end up with poor health. Something called "996 ICU" is doing the rounds on GitHub - a software development platform that claims to bring together the world's largest community of developers. On the domain name page, it is written, "What is 996 ICU? Work 996, sick in ICU." That is to say, if you work from 9 am to 9 pm six days a week, you'll fall sick and land in the intensive care unit of a hospital. The page compared the 72 working hours per week under the 996 working system with the provisions of the Labor Contract Law and appealed that "Developers' lives matter." The initiative received extensive support from programmers. The page had garnered 100,000 stars just three or four days after its inception showing the number of people who supported it. By contrast, some popular topics like one about iOS - a mobile operating system developed by Apple - only received 20,000 to 50,000 stars. Some people call 996 ICU "the project with the fastest rise in stars received on GitHub." 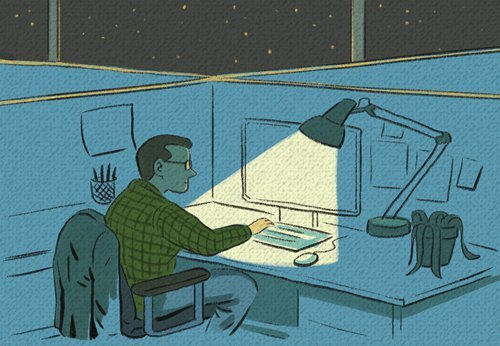 The initiative is a creative way of alerting software professionals to the dangers of working continuously for insanely long hours to the detriment of one's health. But how to pursue our dreams while at the same time keeping fit with an "all in" mind? In China, many leading enterprises have begun to face up to this controversial practice and are trying out a humane approach. Employees may be asked to complete a task within a period of time and can then take working days off, or will be compensated with money. These enterprises have set up online infirmaries, psychological counseling rooms and other healthcare services to help employees deal better with work pressure. They have human resource professionals to organize team-building activities. Furthermore, they slow down decision-making, so as to examine whether their business type really need overtime culture; they begin to pay attention to efficiency after continuous production. These enterprises are trying to figure out where their competitiveness lies, and beginning to realize that taking care of employees' health is the way for enterprises to develop steadily. Of course, it is quite difficult to achieve these goals in all Chinese companies, but we must pay attention to them, care for programmers' health, promote a healthy and flexible working pace, and form a positive and sustained culture in the internet industry. The vast majority of IT professionals should also pay close attention to their own health, be aware of their rights and interests, and dare to say "no" to enterprises that do not follow the Labour Law. IT professionals should take to physical exercise, and pursue their internet product dream with a healthy body, as health is the fundamental capital. While working with an "all in" mind, they should strive to improve efficiency, save time for relaxation, and learn how to fend off pressure by not getting overwhelmed by the workload. Jack Ma, founder of Alibaba, China's largest e-commerce platform, famously said recently that being able to work 996 is a huge blessing. "If you want to join Alibaba, you need to be prepared to work 12 hours a day, otherwise why even bother joining."